Jesus (the son of Christ) talks about his father in heaven: "All things are delivered unto me by my Father: and no man knoweth the Son, but the Father; neither knoweth any man the Father, save the Son, and he to whomsoever the Son will reveal him." (Matthew 11:27) "No One Comes to the Father than through me." One should go through Jesus through, to the father Christ or Krishna! Jesus Christ means: Jesus, the son of Christ oder Krishna. He declared Himself to be the son of God, and NOT the Father. Therefore it does not matter, if we call God "Christ" or "Krischto" or "Krishna". The name "Christ" means "annointed one". This is taken from the Greek word "Christos". Some language historians trace the Greek language to the oldest Indo-European language, Sanskrit, which is 3,500 to 6,000 years old, perhaps older. By finding a Sanskrit equivilant, it is reasonable that we may be able to ascertain the probable origin of the word "Christ". The Greek "Christos" is almost identical in sound and spelling to the Sanskrit word "Kristo", meaning all-attractive. Sometimes we meet an attractive girl named Krista or Christa. These are common American and European names, having their roots in the Sanskrit Name of the Lord Krishna. People in India very often call the Name of Krishna by saying: "Krischto" or "Christo"! 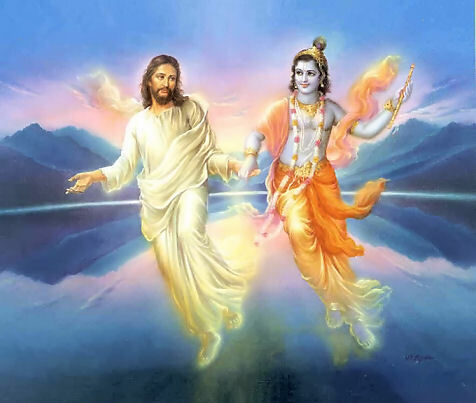 The word "Christ" or "Kristo" or "Krsna" is a variation of the word KRISHNA, one of the countless and ancient names for God Almighty in that language of Sanskrit. The name "Krishna" also means "all attractive". Who is the most attractive person? GOD, of course. Why is God a Person? It is written, "MAN IS MADE IN THE IMAGE OF GOD." If we are persons, then logically, as our creator, God is the Supreme Person. Why is God called "All-attractive"? Because He has everything in full.... including power, fame, renunciation, wealth, personal beauty, and intelligence. Human beings may have some of these attributes in part. But God, as the Supreme Person, has everything in full, with no shortage in any way. No one possesses anything beautiful, intelligent, great, powerful or more opulently than God Almighty. Even the Atheists are attracted to the power of God Almighty, albeit, in a negative manner. 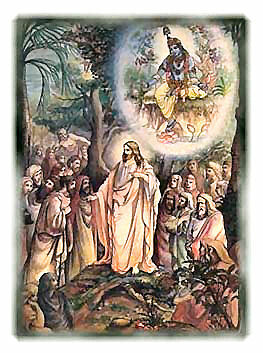 If Jesus now says: Our Father, who art in heaven hallowed be thy Name, than this Name of God is "Christo" oder "Krishna". If Jesus says, that the Name of the Father should be glorified, how come someone saying that God has no Name? We say God-Father. The son generally calls his father "Father", but the Father also has a Name: "Christos" or "Krishna". This is verified by Jesus Himself. If Lord Jesus says "Hallowed by Thy name," there must be name. The name is there, but he did not reveal it openly because the people at that time where not able to properly understand, but he says there is name. What Jesus was teaching 2000 year ago, is not different from that what Krishna was teaching 5000 years ago. We should ask, "What do Christ and Krishna have in commom? It is common knowlege that Jesus Christ is the Son of God, Who he called "The Father in Heaven". He referred to himself as the Son of God dozens of times, and to God the Father over 200 times in the New Testament. What is not generally known is that God has many names in many languages, not just a few Biblical names. One such name for God is Krishna. Initially, we may object, but when we think about this concept without anger, prejudice, or preconceived bias, we can logically conclude that God must have unlimited names, because God himself is unlimited, by the very definition of the word... "GOD". American Indians have names for the Holy Spirit. The Eskimos, the same. Muslims call God "Allah". People in all lands of the Earth have different names for God. If we contemplate this idea for a moment in silent prayer, then we can understand it's simple, obvious truth. There are countless names for God. Why irrationally object, because of our own prejudicial feelings? God, being unlimited, must have unlimited names. This is the logical conclusion. One of these names for God is Krishna, the self-same Jehovah-God of the Holy Bible. Another name for God is Rama. In Hebrew, this truth is explained... "SHEMAH YISRAEL ADONOI ELOHENU ADONOI ECHAD"..."HEAR! O ISRAEL, THE LORD OUR GOD, THE LORD IS ONE." We may want ot object, but God Is ONE, portrayed differently in different cultures and lands of the world by his different names and pastimes. Knowing this truth is the beginning of wisdom and inner peace, the initiation of our own personal mental healing, the casting out of our own "devils" of prejudice and of our unconscious hatred for others. Understanding that God is ONE for all people of the Earth implies; the eventual dissolution of our inner feelings of mistrust for others who seem different than ourselves, but whom Jesus taught us to love even as our very selves. God is ONE, and all human beings are family members. The Old Testament declares that by the Holy Name of the Lord one will be saved, and shall dwell in the house of the Lord forever. In this way, the individual is encouraged to take shelter of God's holy names. "Christ" indicates the Son of God. The name "Krishna" denotes God the Father, as in the Judeo/Christian reference to God. Christ or Krishna, the name is the same. Like Father, Like Son, as the old saying goes. We may conclude that the etymological derivation of the English world "Christ" is the Sanskrit word "Krishna". It is always advisable to chant and sing the holy names of Christ or Krishna. Catholic priests use the Greek name "Christos" freequently in hymns and while chanting prayers. Many Christians also sing hymns, using the English translation "Christ". Franciscan monks and many other monastic sects use the Latin names "Jesu Christe" in Gregorian chants. Also, in India and now around the world, many worshippers of God sing the universal, non-sectarian names of "Krishna". There is no duality or spiritual conflict of interest. In this way, one may chant any of God's millions of names in devotion for protection, self purification and eventual liberation. Unfortunately, many people who believe in God waste much valuable time arguing about the 'correctness' of their own chosen religion. But 'correctness' is not the point, nor the goal, nor the final outcome of religion. Developing our love for God and others is the essential goal of all religious thought. The command of Jesus Christ, the spiritual master of the Christian world is, "Love the Supreme Lord with all your heart, soul and mind," and also, "Love your neighbor as your very own self." It is fairly obvious that the international neighbors of Christians are Hindus, Muslims, Jews, Buddhists, Sikhs, Hare` Krishnas, etc. According to Christ's command, Christians do not need to quarrel with their neighbors of different religious persuasions, but simply love them. Jesus healed others by the potencies of God's holy names. In this regard, Jesus states: "I have come to glorify the Father, and do nothing of my own accord." This was the personal sentiment of Jesus, that everything depended upon God, the Father. He denied doing anything by his own power. We are all powerless without God's grace. Even Jesus Christ is powerless without the grace of God the "Father". If we sing and chant the holy names of the Son or the Father, the end result will be the same. Countless thousands have been healed an purified over the centuries by the holy names of Jesus and Christ. In this world, calamities abound at every step. If somehow or other, we can learn to rely upon the holy names of Christ, Christos, Hare` Krishna, or Hare` Rama, then surely we will dwell in the house of the Lord forever. People who are different than ourselves deserve the same love and consideration that Jesus offered them when he taught us: "Love thy neighbour". Jesus commanded it of those who chose to be called his true followers. "If you love me, then follow my commandments." No one is superior to anyone else. Jesus never had such prejudicial feelings, and considered himself the servant of humanity. Jesus therefore commanded Christians to offer the same love and respect they wished for themselves to all others, whether they be Buddhists, Jews, Hare` Krishnas, Jesuit Monks, or Muslims. By taking shelter of the holy names of God, this love for God and respect for one and all can factually be achieved in a very short time. Srila Prabhupada, the foremost exponent of the Krishna consciousness movement explains that Jesus is Krishna's representative, son of God, and spiritual master. Below are excerpts from Srila Prabhupada's books, lectures, and conversations about Jesus Christ and his relationship with Krsna. Conversation with Father Emmanuel - In 1974, near ISKCON's center in Frankfurt am Main, West Germany, Srila Prabhupada and several of his disciples took a morning walk with father Emmanuel Jungclaussen, a Benedictine monk from Niederalteich Monastery. Noticing that Srila Prabhupada was carrying meditation beads similar to the rosary, Father Emmanuel explained that he also chanted a constant prayer: "Lord Jesus Christ, be merciful unto us." The following conversation ensued. Conversation with Cardinal Danielou - "Thou Shalt Not Kill" or "Thou Shalt Not Murder"? At a monastic retreat near Paris, in July of 1973, Srila Prabhupada talked with Cardinal Jean Danielou: "... the Bible does not simply say, `Do not kill the human being.' It says broadly, `Thou shalt not kill.'... why do you interpret this to suit your own convenience?"